Planting of both corn and my garden started yesterday! Kevin was busy finishing working on the planter and he was able to start planting yesterday afternoon. He came in about 8:30 or so and asked HD if he wanted to go plant some corn. I’ve never seen HD so excited. We couldn’t get his shoes, coat and hat on fast enough! The forecast for this week looks good for planting, so I’m sure we’ll be seeing a lot of planters out in the fields in our areas. As of right now, my boys are out there planting together again! 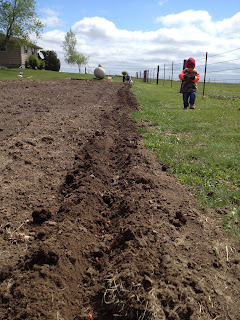 As for the garden, my sister Morgan came to visit yesterday and we were able to get a row of sweet corn planted along with half the peas and all of the carrots and onions. I’m going to wait a week or two before I plant the rest of the garden. I ordered a bunch of seeds from Gurney’s this year and I think I have enough for next year too! Since this is only my second year of planting a garden, I’m still learning. If it turns out as well as it did last year, I’ll be happy! Have you started planting (crops or a garden) yet this year? What kinds of fruits and vegetable are you planting?